Renew Spa Shock Tablets come in both tablet and liquid formulas. The shock tablets are a convenient packaging of the potassium peroxymonosulfate chemical that is the same in both formats. Renew Spa Shock is a chlorine free shock of potassium peroxymonosulfate. It can be used in different ways to keep spa or hot tub water clean, clear and sanitary. It may work as one of two steps in the "Reserve/Renew System." Part one of the system is Reserve, which is sodium bromide. Then, Renew is applied to activate the Reserve. When the two chemicals interact, they create an active bromine to sanitize. Some spa owners have an aversion to chlorine that hurts eyes and skin. Owners like these can easily replace a chlorine treatment with the "Reserve/Renew System" by Leisure Time for clean, sanitary water without the harsh chlorine chemical. Renew Spa Shock may also be used in conjunction with chlorine chemicals for a strong chemical treatment that extends the life of chlorine. Renew may also be used for spa start-ups or maintenance. 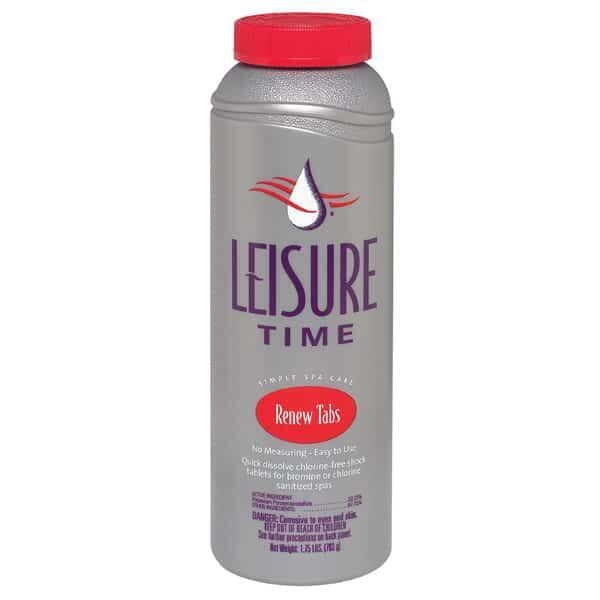 Enjoy the chlorine-free use of this strong and versatile sanitizing formula. To check bromine levels- Shock with Renew Tabs, wait 1 hour, test water. If bromine levels are not 1-3ppm add 1 oz. Reserve and re-test. If the spa has not been used for a couple of days and you test the water before adding Renew, bromine levels may show 0. This is okay, test the water after shoking and you will get an acurate reading.